Metastatic cancer refers to any form of cancer that has spread from its original point of development to other parts of the body. Cancers can spread through the lymph nodes or through the bloodstream, and the same is true for mesothelioma. Thoracic surgeon Dr. Farid Gharagozloo explains how metastasis affects a patient's eligibility for mesothelioma surgery. Doctors know that some cancers are predictable as far as the organs to which they will metastasize. In some instances, this predictability can guide doctors and help keep an eye on certain parts of the body that are susceptible to tumors. Because mesothelioma is not generally diagnosed until its later stages (usually stage 3 or 4), metastatic disease is common at the time of diagnosis. Mesothelioma metastasis, however, can also occur as the disease continues to progress. How Quickly Does Mesothelioma Metastasize? Mesothelioma is known as a particularly aggressive cancer with a range of development rates. Although the genetic changes that lead to the disease’s initial development can take decades, the cancer grows quickly and spreads to other parts of the body within a matter of months. What makes it so aggressive, and how does this affect life expectancy? The cancer’s aggression is partly a result of its location. It almost always develops in the chest cavity or the abdominal cavity, where it readily affects vital organs like the lungs and heart. Certain types of tumor cells are also particularly dangerous and can spread more efficiently. These factors can lead to short survival times of a year or less, but proper treatment can help prolong life. It is also theorized that mesothelioma may actually travel more quickly than other types of cancer. This is because the disease is most often located in or near the lungs, which transfer oxygen throughout the body. Therefore, cancer cells may be able to enter the bloodstream and circulate through the body. Cancer progression can sometimes be detected through diagnostic imaging tests, which include MRIs or CT scans. Doctors usually suspect that a cancer has spread when a patient complains of symptoms that are not generally associated with asbestos cancer. At that time, tests or biopsies will be performed. Mesothelioma can spread throughout the body in a number of ways. Early in the cancer’s development, before metastasis, cancer cells can invade nearby healthy tissue through a process called local invasion. Metastasis generally occurs when cancer cells travel through the bloodstream or lymphatic system to distant sites. Once mesothelioma cells have spread around the body, they can invade any nearby organs and cause secondary tumors to develop. Cancer also can grow and spread through angiogenesis, a process that forms new blood vessels in the body. This happens when cancerous cells release molecules that reach nearby healthy tissue and form new blood vessels. The fresh supply of oxygen and nutrients from these blood vessels allows cancer cells to develop into secondary tumors. Researchers are studying ways to promote and block angiogenesis to develop a number of anti-angiogenic medications. These treatments may be the key to slowing or halting the spread of cancer. Drugs being evaluated for mesothelioma metastasis include semaxanib (SU5416), thalidomide and tetrathiomolybdate. In clinical trials, the three medications demonstrate an ability to help stabilize the disease and increase survival. Patients diagnosed at stage I have the best prognosis, living a median of two to three years. Doctors use a mesothelioma staging system to help gauge the development of pleural cancer. The disease is the least developed during the early stages, when the cancer is localized in or around its origin site. At these stages, the cancer may be treated with a combination of potentially curative measures such as surgery, chemotherapy and radiation therapy. 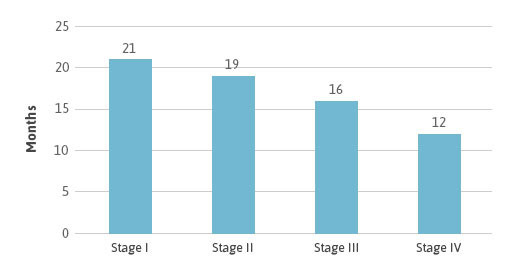 Patients diagnosed at stage 1 have the best prognosis, living a median of two to three years. By stage 4, the cancer has metastasized, and tumors have developed in distant areas of the body. This is the most difficult to treat because the cancer is so widespread. At this stage of development, treatment is limited to palliative, symptom-controlling care. This leads to a life expectancy of less than a year. Once mesothelioma has metastasized, treatment will probably change from its original course. The oncologist will need to address the cancer that has spread to other parts of the body and may recommend different therapies depending on the size, number and location of tumors. Doctors often suggest some combination of surgery, chemotherapy and radiation. However, once the cancer has spread, they usually offer palliative treatments to ease the pain and improve quality of life. An oncologist with experience in treating this aggressive asbestos-related disease will be able to recommend the best course of treatment for both the original disease and the metastases. For many years, doctors considered pleural mesothelioma a localized disease with limited ability to metastasize to other parts of the body. However, a 2012 postmortem study revealed the majority of the 318 mesothelioma patients involved experienced cancer spread to the opposite side of the chest and distant sites. Cancer spread to the brain and central nervous system is significantly rarer, occurring in only about 3 percent of postmortem cases. By stage 3 and 4, pleural mesothelioma metastasizes through the blood to distant sites in more than 10 percent of cases. By the time most people receive a mesothelioma diagnosis, their cancer is already in the later stages of development. If the cancer has spread to distant parts of the body, treatment options tend to be palliative in nature, meaning they aim to relieve symptoms and provide comfort rather than cure the disease. In its early stages, peritoneal mesothelioma generally does not spread beyond the peritoneal cavity, which contains the stomach, spleen, liver, intestines and other abdominal organs. As the disease progresses, cancer cells spread through the lymph nodes and blood. This can cause secondary tumors to develop in nearby organs and distant locations. Doctors find spread to these locations in nearly 50 percent of all cases, and most of the time metastasis isn’t discovered until autopsy. Bone metastases can cause a variety of problems for cancer patients, and they can be quite difficult to detect. Mesothelioma patients who do develop it may suffer bone pain, fractures or spinal cord compression. Doctors test for the spread of cancer to the bones with a bone marrow biopsy or a bone marrow aspiration. If mesothelioma bone metastasis is suspected, doctors can run a number of tests to form an accurate diagnosis. Testing starts with a blood or urine sample, which may show abnormalities. A high level of calcium in a blood sample, for example, may indicate cancer spread to the bones. Little is known about how bone metastasis affects mesothelioma prognosis, but a timely diagnosis and proper treatment can help extend life span. We can help you find a top mesothelioma specialist who can help you understand mesothelioma metastasis. It can be difficult for doctors to detect when mesothelioma has metastasized. Distant spread occurs late in the cancer’s development and doesn’t always cause noticeable symptoms. If metastatic cancer symptoms do arise, they usually affect the location where the cancer has spread. However, some symptoms of mesothelioma metastases are no different from common symptoms of mesothelioma and other cancers. Doctors often discover metastases by chance after chest X-rays or other tests. 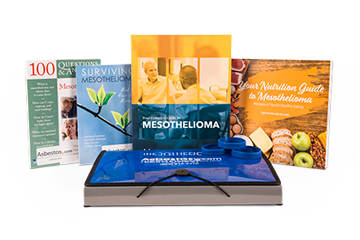 Our Patient Advocates can answer your questions about mesothelioma metastasis and help you find treatment. The site of the cancer affects how quickly it initially develops, as well as how fast it spreads. Overall, mesothelioma has a latency period of 20 to 50 years, meaning it can take two to five decades for damaged cells to become cancerous. But this latency period varies slightly based on where the cancer develops. Pleural is the most common type and has a typical latency period of 30 to 50 years. The next most frequent type, peritoneal, only takes about 20 to 30 years to appear. After initial tumor growth, location can help predict further development rates. Pericardial cancer is considered the most aggressive. The tumor grows in such close proximity to the heart and causes immediate complications, leading to a mean survival time of five to eight months after diagnosis. Other types develop almost as quickly. Once the cancer manifests, it continues to develop by growing larger and spreading to other areas of the body. The rate of metastasis depends in part on the cellular makeup of the tumor. Tumors with an epithelial makeup have a uniform, ordered structure and must spread via lymph nodes. These tumors are typically less aggressive and spread more slowly, adding time to life expectancy. Sarcomatoid and biphasic mesotheliomas, on the other hand, are more randomized and complex. These types of cells can spread through the blood, a speedier process than lymph node involvement. These tumors spread more quickly to other areas of the body, minimizing treatment options and reducing expected life span. In addition to location and histological type of tumor, life expectancy may be affected by patient factors such as age and overall health, as well as available treatment options in each specific case. Life span is also affected by the cancer’s stage of development. Flores, R.M. & Rusch, V.W. (2005). Staging of Mesothelioma. In H.I. Pass, N.J. Vogelzang & M. Carbone (Eds. ), Malignant Mesothelioma: Advances in Pathogenesis, Diagnosis, and Translational Therapies (pp. 402-415). New York, NY: Springer Science+Business Media, Inc.
King, J.E., Galateau-Sallé, F. & Hasleton, P.S. (2006). Histopathology of malignant pleural mesothelioma. In K. O'Byrne & V. Rusch (Eds. ), Malignant Pleural Mesothelioma (pp. 61-104). Oxford: Oxford University Press. Verschraegen, C.F., Key, C.R. & Hassan, R. (2005). Clinical Presentation and Natural History of Mesothelioma: Abdominal. In H.I. Pass, N.J. Vogelzang & M. Carbone (Eds. ), Malignant Mesothelioma: Advances in Pathogenesis, Diagnosis, and Translational Therapies (pp. 391-401). New York, NY: Springer Science+Business Media, Inc.
Ed. by O'Byrne, K. and Rusch, V. (2006). Malignant Pleural Mesothelioma. Oxford University Press: New York.